Co-opting the Black Lives Matter movement delegitimizes black liberation. It can be difficult to make sense of how the myriad of growing social justice movements intersect, and simultaneously, how they are independent. Solidarity with a movement should be all-inclusive, but there is a line between supporting and co-opting a movement. Co-opting a movement (for a variety of purposes) can reduce its potency and sometimes even delegitimize its original aims. It’s a dangerous line that we as a majorly capitalistic, often selfish society tread, and it’s high time that we realized how these lines are drawn. The Black Lives Matter movement emerged in response to murders like that of Trayvon Martin at the hands of George Zimmerman and the intense grief and frustration that surrounded them. It is a response to the historically rooted dehumanization of black lives, “a call to action and a response to the virulent anti-Black racism that permeates our society.” It is an intersectional movement that wants to rebuild the black liberation movement, and bring to its center disparate groups that have too faced undue discrimination. It is a cry of support, anger, and resilience that quickly spiraled into something momentous, pivotal, and possibly redefining for black liberation. In its success, the movement has received an outpouring of support from the world over, including from people of different races. But then the All Lives Matter movement became mainstream. This movement was based on the claim that the Black Lives Matter movement was not inclusive of other races (especially white people), that it was guilty of the same discrimination it was accusing others of. While the Black Lives Matter movement was deeply rooted in creating a sense of community and inciting discussion, the All Lives Matter movement grew out of privilege and a flagrant mischaracterization of the Black Lives Matter movement’s goals. It was not born of systemic discrimination or historical oppression, but of a need to perpetuate the existing system that benefits whites. Ultimately, all this reactionary movement does is invalidate black lives and their cries for justice. Though proponents of the color-blind argument would say that this is untrue, it seems clear that color-blindness is rooted in denial and not acceptance. By starting the All Lives Matter movement, supporters are perpetuating the same systemic racism that is hidden under a seemingly neutral approach. The color-blind approach is problematic because it literally blinds people to the role color plays in existing structures, both big and small. All Lives Matter takes the very core of the Black Lives Matter movement and fundamentally disrespects it. It denies that there is any need for black lives to receive immediate and focused attention. It denies a history of organized oppression and slavery. It denies black people their right to emancipation and equality by refusing to even acknowledge the problem. The numbers prove an indisputable point that many cannot accept—that black people are seen as subhuman, both socially and politically. By parading under the facade of non-racism, the All Lives Matter movement co-opts a movement and panders to a large group of people that are already complacent in their privilege. It derails change and conversation and misdirects the rightful attention that the black liberation movement rightfully deserves. Though these activists could claim that All Lives includes Black Lives, they need to realize they are not allies of the movement, but adversaries. How in the world did they translate black lives matter to: only black lives matter? The answer is simple—their principles are based on convenience and fake intersectionality, not reality. The co-opting of this movement has occurred in subtler ways as well. Capitalism has swooped into what seems like the newest profitable niche market. In an attempt to boost sales among black people, many companies have utilized ads that subtly portray political images of black people. On Aphro-ism, a black feminist blog, a post on this issue prominently features two uncommon-looking ads. The first is an ad by Discover, featuring a black woman with her natural hair, her fist raised in a way clearly referential to Black Power. The second image portrays a black man shouting into a megaphone in an ad for T-Mobile. It’s hard to relegate these poses to mere coincidence, in an ad campaign that was presumably impeccably planned. This is without a doubt politically charged, and its convenient appearance during a period which renders it relevant seems absolutely deliberate. This is a cop-out: Discover and T-Mobile can simultaneously present themselves as empathetic with black resistance yet avoid being overtly political, in case other consumers were to feel uncomfortable with their symbolism. They are afraid to commit themselves fully, but not afraid enough to exploit a movement for its own economic advantage. As Aph Ko, the writer of the post, powerfully puts it, “they are reducing our anti-white supremacy movements to an empty aesthetic. This is a form of digital minstrelsy, using our faces and struggles to be the cover art for capitalist, anti-black corporations.” Though greater visibility of minorities in mainstream ad campaigns is an exciting development, the ads hardly seem designed for inclusivity. They are more defined by half-heartedness and economic expediency; they create the impression that black lives matter only when they add value to other lives. The Black Lives Matter movement was also manipulatively co-opted by right wing pro-life advocates. Fran Eaton, a white woman, wrote in her blog post that the movement ignored the lives of aborted black babies, and black women who had lost their lives in surgical abortions. Eaton blames Planned Parenthood for diminishing black lives, taking away agency from women who actually chose to have abortions. She oversimplifies the situation, saying “16 million tiny Black lives have perished in abortion clinics,” as though the abortion of fetuses is a crime of the same magnitude as murdering innocent black men. Eaton and others like her have adopted a movement that does not overtly concern them and molded it to fit their own beliefs. This is selfish and misinformed. It is disrespectful to all those who have suffered brutality and years of oppression and stigma. The ambiguity of the words “black lives matter” in some way affords them the freedom to distort the aims of the movement to suit their own needs. Yet what is not ambiguous is what the Black Lives Movement actually set out to do and who this movement actually belongs to. This does not include those people who lack a critical understanding of institutionalized racism. This does not include activists of other movements that are disconnected with justice for black lives. This does not include a corporate world that cheapens a movement by putting a price on it. This is for, by, and of the black people. Though the movement’s voice resonates in a call for global solidarity, it does not call for a detached observer’s patronizing view of what black people should really protest against. It’s about time that we as a society learned the difference between solidarity and co-opting a movement. 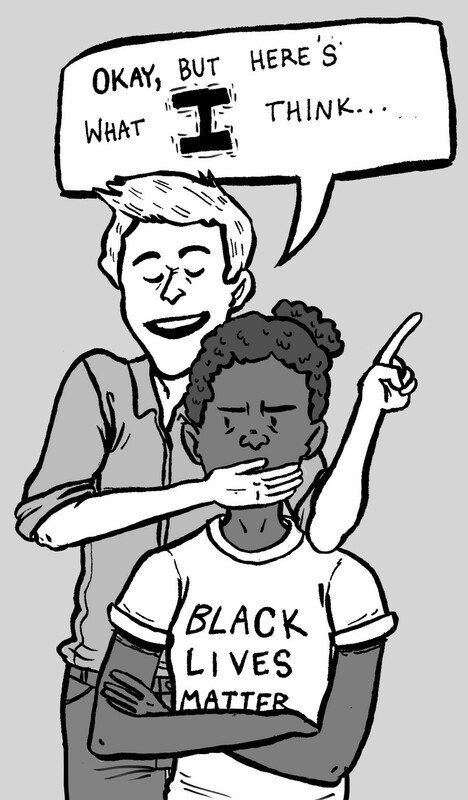 Author’s note: As a non-black person, the irony of my writing this article is not lost on me. However, this column is not my way of adding my personal narrative to the movement, or saying I have a rightful claim on it. It’s just a navigation of the confusing politics of identity, and an expression of my longtime disdain for people co-opting stories that were never theirs to tell. I hope everything I say in this article is respectful of the same boundaries I’m trying to understand. Urvi Kumbhat is a first-year in the College majoring in English and political science.